Here is an expression of a generalized symbolic operator. This concept led to a symbolic operator developed by Robert Fludd (1574 - 1637 AD), it is known as the “Divine Monochord”. This “instrument” serves as a versor analog computer for the Solar System, and in a strange way also for the Tesla Magnifying Transciever. It represents a musical hyperbolic versor operator. 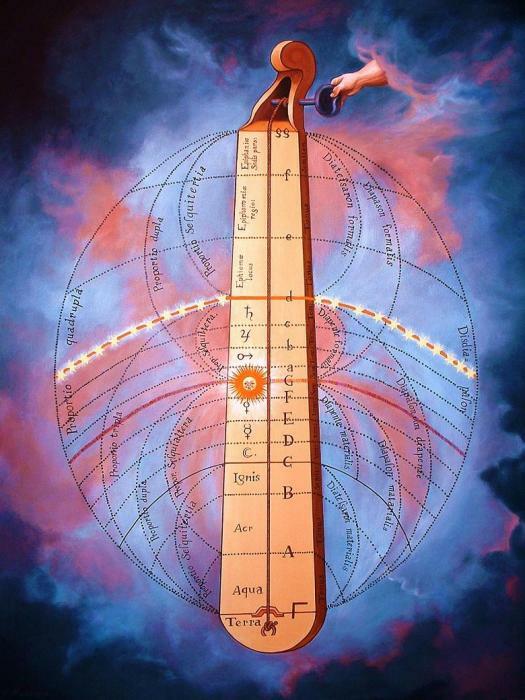 Beginning with the Earth at gamma, , GROUND, the Monochord progresses thru the four elementals, the Sun, Moon, and the known planets, and moreover thru the unknown planets, terminating on g, the planet Pluto. At the tip of the Monochord the hand of God, AERIAL, sets the cosmic constant (a.k.a. one over c square) and thereby sets the cosmic pitch of the Divine Monochord. What is important to notice here is that not only did Uranus, Neptune, and Pluto evade notice in this era, but their very existence would have been decried a disruption in the “Universal Order” that had already become an institution. Yet these three unknown planets are implicit in the Divine Monochord. Astronomen hebben gebruik gemaakt van de Spitzer Space Telescope om de staart van komeet ISON te bestuderen. Hieruit blijkt dat de staart veel kooldioxide bevat, evenals een enorme hoeveelheid stof. Het gaat om 1 miljoen kilo kooldioxide en 54 miljoen kilo stof dat dagelijks wordt uitgestoten door de komeet, waardoor een staart van 300.000 km lang is ontstaan. Zoals alle kometen, is ISON voor een deel aan het verdampen door de straling van de zon. Op verschillende momenten gaan verschillende bevroren gassen vervliegen, waardoor de langgerekte en typerende komeetstaart ontstaat. Het is de verwachting dat de komeet op 28 november z’n grootste helderheid zal kennen. [quote=""dodeca" post=48565"]ha ha die minkukel rolstoelers wat een mega sukkels zijn het weer en de rest van het internet trappe er weer lekker in waarom? Wel ze hebben totaal op het verkeerde paard gewed en....zo hoort het ook. Waar heb dokkie het over, wel komeet lovejoy het zielige komeetje zou moeten vergaan omdat het vlak langs onze zon zou gaan en uw wete het, vlak bij onze elektrische zon want dat is het (de meeste rolstoelers donderen weer uit hunnies stoel en zo hoort het ook)is het heet dus moet dat ijsballeke van een lovejoy wel de pleuris krijgge. Volgens drolminkukelrolstoelers is een komeet een soort "vieze ijsbal" die verdampt vandaar zijn staart. Tuurlijk waren er weer domme rolstoelmongoolminkukel sites die beweerde dat de staart weg was na de passage om onze elektrieke zon. Hoe kan dat nou dacht menig mongoolstoeler dat die komeet niet de pleuris krijgge? Wel beste drolstoeler hullie zitten totally verkeerd want kometen benne niet dirtysnowbals die vinde je alleen maar in de kerk met hunnies leuter in een kleuter.. The natural conclusion to the key concepts presented in the Planet Amnesia narrative, is that humanity suffers from symptoms arising out of trauma induced by catastrophic Earth changes. My revelation in compiling such revisionist ancient history, is that there are clear answers to how culture developed and incorporated such profound experiences. At the end of the day, the value of this Planet Amnesia inquiry into planets and plasma, gods and geology, catastrophes and cataclysms, is the impact on our personal lives. Science is stimulating and mythology is satisfyingly mysterious, but the real rewards are throwing off the shackles of mistaken belief and arriving at a better understanding of what is really going on. If by way of recovering forgotten, controversial and discordant information we can shed some light on the origins of our belief systems and why we act out certain collective social behaviors, we will go a long way towards creating a human life more genuinely filled with happiness and meaning. For me the task in these pages is to draw back the curtain and search for the origins of the collective dysfunction operating in the world today. Something is definitely amiss on this planet. Clearly, humanity has created a cultural reality for itself through a built up series of reactions to events occurring over a long period of time. Outside of the effects from basic physical survival issues and Earth changes inflicted upon us, we humans have made up much of our so-called psychological reality. We weren’t programmed to war with each other, to enslave the vulnerable, to establish an elite that lorded over the masses. These are all learned behaviors, everyone having colluded to create the end result. Where did these troubled behaviors come from? Or is this just what humans have always done, a type of animal instinct that fouls its nest on the way to Armageddon? IMO, the answer is no. Humans have led many different kinds of lives throughout Earth history. In the Saturnian era, the situation was completely different. The reason we are clueless about this is that we are suffering amnesia and in the West, still walking around in a stupor under our new religion of scientism. We are willing to readily believe the misinformation and lies that are the hallmark of modern society, because we erroneously believe we won’t have to face our troubled past. We don’t want to encounter the possible immense cosmic indifference to our being. Instead we choose to surrender our intelligence to outmoded belief systems that promise us salvation from our fears. The reason why we do this is that we have been traumatized and are suffering a collective amnesia. Nothing has really been forgotten, but we have sublimated this memory and shoved it into the unconscious. Despite this, there are clues everywhere. Until we each break out of this numbed state of existence and see the old belief matrix for what it is, we will continue to sleepwalk through life. This sleepwalking is killing us because it creates a vulnerability that others in our society are taking advantage of. Most of us don’t even know it. To back up a bit and wrap up this article, it is important to recall how we arrived at this juncture. If we agree that humans have experienced multiple Earth upheavals in era ending catastrophes, causing mayhem and death, terminating civilization, leaving humanity prostrate for generations afterwards, we see a basis for trauma. If we also agree that a collective unconscious exists that never disappears or forgets, and that troubled memory gets driven underground towards it, we are halfway there. The other half of our discovery is the symptoms of this condition, the distortions in behavior that rise to the surface despite their wholesale suppression. This is classic psychology 101 and isn’t hard to understand. It is the story of an abused person, of sequestering memory to avoid the pain of recall. It is in the creation of split personality as a way to deal with the possibility of future surfacing of memory. If the abuse were to happen again (more Earth cataclysm and fallout), the personality that was created to deal with the horrendous initial trauma emerges and is the one to re-experience it. After the event subsides, the healthier personalities emerge. The traumatized personality takes the abuse so the others don’t have to experience it, and hides out from them. This traumatized personality becomes the hidden, dominant force that holds all the secrets, all the cards. It’s also the one that is the troublemaker, the one that easily destabilizes the others. It is the one that needs to be continually suppressed lest it overwhelm the situation and create chaos, a condition similar to the initial trauma. This is what we are dealing with on a collective basis today due to our ignorance of the past. In this way we can talk about group social behaviors similar to the abused individual personality. Where to go from here? There are only two outcomes. One is the path of self-destruction through further self-abasement, a continued ignorance that ends in an acute or chronic decline in quality of life. This could also end in its own catastrophe, a mirror event of the original trauma. The other outcome is a great healing. First it starts with a recollection of past events, then a touching into the emotional content. It evolves from there through the psychotherapeutic grief process. It is dealing with loss, with pain, with anger, with sadness. It is all these things and more. This is what humanity has yet to deal with. Perhaps we may also be mourning the loss of a past golden age under Saturn, stricken by our proverbial Fall from grace that is remembered so obliquely in worldwide myths. The healing comes from both our individual and collective recovery of our sovereign nature in its full knowingness, dispelling the forgetfulness, whether self-inflicted or by society. Once this happens, the rest takes care of itself. We are on the path to getting healthier and no longer in the dark. Amnesia is forgetfulness. It is most often associated with psychological trauma. In fact, the only other kind of amnesia is caused by physical damage to the brain, which originates from an organic cause. In the case of trauma, the brain has buried the memory of something as a way of dealing with a grave pain that was experienced. Of course, no memory can be completely obliterated, and therefore a residue is left, but is no longer readily accessible to the waking consciousness. It has been repressed and driven underground. Where does the memory go? It ultimately slips into the unconscious, but not before it leaves its imprint in many places. On the cultural stage, myth is the place that memory goes, to record these great upheavals in our lives, but in a reinterpreted form that is safe for us to self-reflect upon. We both want to remember and not to remember these tragic and difficult transitions. We work hard to sublimate this memory to ease ourselves into a familiarity with past events that are no longer so raw and unsettling. Amnesia is a cloud of protection, and underneath that cloud there exists the activity of the sub-conscious mental residues. The psyche must deal with them in some way lest they overload the emotional/psychological body of the surface consciousness. All kinds of compensating and adaptive behaviors come into play. Not only helpful myths get created – other times maladaptive behaviors, or psychopathologies get established as a dysfunctional response to trauma. There are a host of symptoms possible under the familiar banner of PTSD. Also contributing, are reactive behaviors associated with abuse, with coping mechanisms seen in split personality disorders, self-created in order to sequester the disturbing emotions in a hidden away part of our being. In such ways we become terribly vulnerable, open to being manipulated by others promising succor and salvation. The human response to trauma is to provide an amnesiac cover so that in the background we can subliminally encode these memories in our collective and individual consciousness and not be overwhelmed. We don’t want to be entirely rid of it, but to keep it as a badge of passing as one of the more precious memories of our raison d’être. This can either be a neurotic entanglement or one of healthy acculturation. We are survivors and we have lived to tell the story. It is a love/hate relationship - we both want to bury the memory and raise it up. In the example of the collectively devised mythic explanation, in the end we raise it up, but in an altered, usually anthropomorphic way that gives it a meaning that is palatable to us as well as our descendants. At times, this process gets twisted and becomes encumbered by agendas of social control over the meaning and function of these myths. The outcome can be coercive and psychologically unhealthy. This is the dark side. When we bring the Earth catastrophes into the picture, as de Grazia does, and posit the involvement with a projected god who is an agent of these upheavals, we get a sudden rich picture of a developing amnesia. Events are so overwhelming that we must retreat into interpretations that are self-familiar. So there we have it - the physical and mental trauma is too great and so is denied in its bare truth. We must put a god/human face on it to access it. Unfortunately, hidden away in this repressive response is a malady that eats away at our human happiness. We are lost to the complete picture of what has happened. In this case the amnesia has been incorporated into the body politic, and serves as a bulwark against recovering any future memories of past cataclysmic events. Neuroses flower in response – we go to war to replay old catastrophes. We recreate such vicarious events as a stage to reengage our memories. This disappointing state of affairs is our legacy in the modern West these days. We are still acting out old hurts. That’s what we do in order to work out our collective karma – try it on for size one more time and see if the same result occurs. This need to continually revisit the tragedy is the compulsion that comes from our need to re-experience the intensity of the event, for we are both fascinated and appalled. For some, replaying the vicarious experience can help to exhaust the struggle by finally seeing it more plainly, or conversely others may drive deeper into neuroses and change their status of victims into perpetrators and keep the game going. Left as an instinctual compulsion, it continually reinforces itself, completely divorced from the memory of what originally set if off. Many of our religious based myths and cultural ethos were engineered in reflection of the struggles of long ago, and no longer serve us well. The catastrophes, the human trauma and the forgetfulness still haunt us today. We are rigidly defended against this recollection, as it has not been properly dealt with. In a sympathetic response we can instead revisit these memories and in the light of a modern syncretist movement make sense of them so they no longer haunt us. Despite the catastrophes being tragic in loss of life and immeasurably damaging to culture, we stand apart from those times on a more stable footing. Perhaps now is the time to take a closer look and chip away at the amnesia that still hovers around us. For the hour is late, and our entrenched human psychopathologies are leading us to the brink of self-destruction. We must break out of this self-imposed amnesia and the matrix of dysfunctional belief and unhealthy response we have led ourselves into. The only way to heal our dis-ease is to recover our unconscious collective memories and hopefully make new sense of them in the light of a more complete and compassionate understanding of a past humanity under siege. Ik zie Carl Gustav Jung, maar in een iets ander jasje..
Trauma creates altered gene expression, that is altered epigenetics, which can be passed on to the offspring. And it is these epigenetic changes we now have that is the big effect, not some effect of repression of our ancestors traumatic experiences. Of course recovering those very ancient experiences, somehow ? ?, may well lead to reversing or altering the epigenetic changes. There may be other ways to alter those epigenetic changes, but it is these epigenetic changes that are the issue. And this needs to be stated and understood in any discussion of amnesia or ancient trauma. And one wonders just how the survivors described to their offspring the starry effects they saw. It would surely have been in terms of gods. Perhaps some of the gruesome things would have been left out. And so there would be stories of happy times destroyed by angry rampaging gods. The offspring would have recognized the planets as the gods, but as things calmed down the stories would have persisted but the connection to the planets would have slowly subsided because of the disconnect between the little dots of light in the sky and the description of the planets in the stories. The gods became something else. "...Star patterns, alignments, solstices, plasma events, eclipses, perhaps even binary star systems, this and so much more has been constructed or engraved into the rocks and positioned along one ridge near Kariong, and is far more sophisticated..."
We are of the opinion the cluster of engraved astronomical markers found on a series of rock platforms is without parallel in Australia, and perhaps the world. Within a span of 3.5 kilometres there are at least 16 major rock platforms (at a location kept secret at this juncture) which contain no less than 3,500 star markers. Conducted after extensive consultation with the relevant Original Elders and Custodians, and set against a backdrop of an enormous amount of Dreaming stories focused “on top,” in particular the Seven Sisters (the Pleiades), the construction of so many markers is part of a trend, verging on obsession, the Original people had with distant celestial objects and constellations. Our estimated tally of 3,500 star-markers is extremely conservative, many platforms are yet to be seen, and it is possible some will never be seen. We set ourselves two tasks: to determine the approximate number of star markers engraved and the possible reasons that inspired these people to devote so much time and effort chipping and pecking into rock. To begin with, we are by no means the first to see these engravings, undeniably many have obviously seen the thousands of engraved circles over the years, but amongst non-Original circles nothing seems to have registered. It wasn’t until researcher Paul White was assessing the credentials of the extremely contentious set of 300 hieroglyphs found on three sandstone walls near Kariong, in work not related to any astronomical issues, he and his colleague came upon the set of star markers closest to the glyphs. Soon after the positioning and alignment of these Original engravings of the night sky was fed into computer software at Sydney University and according to White, “the star charts reveal an unbelievable match with the star pattern above Gosford around the year 2,500 BC. The whole thing is a giant star map". Coupled with the advice Original Elder Gerry Bostock gave when reminding us this place resonated to the celestial theme of “as on top so below", and the fact that the original Creation Spirits are also called Sky-Heroes, all of these Original truths convinced us that the chances are high that many of these engravings/constructions serve astronomical purposes. If so, how far does this “giant star map extend", and just as significantly, is “the whole thing" limited to mapping the stars? How sophisticated and ancient is this astronomical complex, and in what way, if any, does this site fit into the present expectations and notions relating to pre-Cook Original history? In what only accentuates the inconvenient complexity and diversity of what was engraved, and the immediate need to protect and fully research all of these platforms, one deceptively small piece of rock which is claimed to bear hundreds upon hundreds of holes that represent the Milky Way, has either been stolen or is in safe-keeping. Local researcher and historian, Boris Branwhite, noted that “in 2002, a 1 meter by 800 cm (surface area) rock with hundreds of small circular holes was discovered at Wadalba (Central Coast, NSW). This sandstone rock appeared to be a Milky Way representation, with brighter stars having deeper holes. Aboriginal Elder Alan Moarywaala Barker identified this arrangement as a star map. This rock was removed by unknown persons in approximately 2009. Then, in what only complicates procedures, all on site during the measuring and recording of these astronomical markers independently made note of cuts, curves and angles in the rock that required technology assumed to be absent in this country until very recent times. We are all of the opinion there are some engravings that could not be the end result of any application of rock on rock. Even the idea of a metal blade being responsible seems to fall well short of the mark, some of the curves are so exact and uniform and couldn’t be cut with more precision today, and there are incisions in the rock where the gap is barely a millimetre wide. Irrespective of who was responsible, the fact remains that the refined tools needed to fashion such delicate markings are not in the Original tool-kits as claimed by academics and books. The oldest astronomical construction is found at Wurdi Youang (Victoria) and contains a sizeable set of rocks that mark “the setting sun at the solstices and equinoxes when viewed from the three prominent stones at the western apex" and is considered to be between 10,000 to 20,000 years old. As impressive as this construction undeniably is we believe it pales by comparison. Star patterns, alignments, solstices, plasma events, eclipses, perhaps even binary star systems, this and so much more has been constructed or engraved into the rocks and positioned along one ridge near Kariong, and is far more sophisticated. Not only is this site more numerous and complex than Wurdi Youang, with a base date of 4,500 years already factored in, it would not surprise in the least if one of these engraved star charts is found to be older than Wurdi Youang. Moreover, within this cluster of rock platforms there is a central point, one shelf measuring 135 metres, which carries at least one fifth of the entire tally. We have recorded the position of 191 star markers, and there are no less than 500 engraved shapes still to be charted. To the best of our knowledge this series of platforms is not only the most intensive ancient star chart in Australia, but we believe it has no parallel in the world. In what only adds to the intrigue, not far away many other pieces of archaeology, both engraved and constructed, have been found and they are no less unique and some are even more controversial. More has to be done, the area surveyed, along with all that still has to recorded, demands protection rather than the apathy and strident denials. But it doesn’t stop there, there is the immediate obligation to correct some of the sins of the past and rewrite humanities’ ancient history paying special attention to the Australian Original people’s role and impact. This area has only just begun to give up some of its secrets, but will only continue to do so if every step taken and word written comes about through direct consultation with the relevant Original Elders and Custodians of Lore and Land. *In our earlier paper of 22 pages (which can be found on Wake up World) we were much more conservative in our estimate. Since that paper was written, one platform was found containing at least 500 star markers and many others with hundreds of engravings, hence the revised estimate of 3,500. Bragg, Gavin. "Star Marker Map ", 2013. Noris, Ray P., Cilla Norris , Duane W. Hamacher, and Reg Abrahams. "Wurdi Youang: An Australia Aboriginal Stone Arrangement with Possible Solar Indications"." Rock Art Reseach,no. 28th Sept. 2012 (2012). White, Paul. "Letter to Cathie." 1999. Photos by Ryan Mullins & Gavin Bragg. Paul White, "Letter to Cathie," (1999). Unpublished Work – Letter. Gerry Bostock, 2013. Personal Communication. Boris Branwhite, 2013. Persopnal Communication. Ray P. Noris et al., "Wurdi Youang: An Australia Aboriginal Stone Arrangement with Possible Solar Indications"," Rock Art Reseach, no. 28th Sept. 2012 (2012). Gavin Bragg, "Star Marker Map " (2013). Diagram. Als het noordelijk halfrond voorzien werd van gloeiend paars licht - 24 uur per dag, dan was wellicht het zuidelijk halfrond donker - of wellicht een soort dag nacht ritme, waarbij de sterren dus duidelijk zichtbaar waren. Symbolisch wordt de aarde ook vaak afgebeeld met een "licht" noordelijk halfrond (bovenaards?) en een "donker" zuidelijk halfrond (onderaards?). De ceremonimeester die de opdracht geeft doet dit heel bewust,de uitvoerder snapt er redelijk wat van maar heeft de finesses niet door. Degene die erdooor gebruikt worden ontgaat letterlijk alles.Waarom ontgaat hun letterlijk alles? Omdat ze helemaal niet aktief kijken. Door nu aktief te kijken participeer je mee in de energie. Met die energie kan elk individu doen en laten wat ie wil,dus zowel positief als negatief mee omgaan. Probeer in eerste instantie gewoon aktief het ritueel te "zien", je gaat dan de vortexen herkennen.Dit is al de moeilijkste stap want meestal wil men NIET aktief kijken. Maw men wil NIET verantwoordelijk zijn. Want aktief kijken betekend participeren (meedoen) en dus ook op energetisch niveau meegaan. Voorbeeld: je ziet een ritueel (geometrisch maar het kan alle vormen aan nemen) en je ervaart dat negatief,dan aanvaardt je dat, maar omdat je het aktief ziet ,besluit je omdaar aan NIET mee te doen. Je steunt de aktie niet. Maar je laat het zoals het is. Dat niet steunen betekend dat het niet kan groeien van jou energie. Nu gaan de meesten zeggen ja maar die anderen kijken niet eens! Dat is niet jou probleem,jij heb je eigen pad en ga nooit een pad van een ander bewandelen dat is zonde energie. Het zal nu wel duidelijk zijn hoe bewuster (veel kwartjes die vallen) men is des te aktiever kan men kijken. Op een gegeven moment wordt je participatie zo sterk met de matrix,dan kan je je ervaringen ombuigen. Jazeker, je kan je eigen verleden wat gewoon nu is veranderen zo ook jou toekomst wat gewoon nu is kan je veranderen. Je kan zelfs van de ene ervarings universum naar de andere ervarings universum gaan. Je gaat letterlijk aktief je multidimensionaliteit beheersen. Dit noem ik toveren. De volgende afbeelding is weer zo iets. Kijk goed waar het KAmer lid (ka =geest, mer=vortex) achter staat. Sommige leden pakken de driehoek bij de punten vast tijdens hun betoog en maken dan zo met hun armen en hun hoofd het onstane "wiebertje". Frappant ook de box die naast dit Kamerlid staat. Tussendoortje, kwam het tegen in een krantenartikel. Paleis Huis ten Bosch is er niks bij. 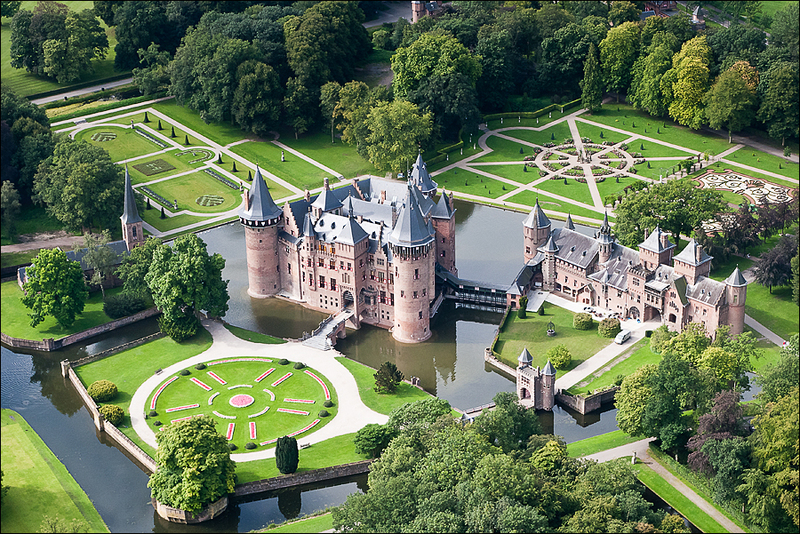 Kasteel de Haar (vroeger Het Huys te Haer, van Oergermaans *Haru, zandige heuvelrug) is een kasteel bij Haarzuilens, in de omgeving van Vleuten in de provincie Utrecht. Het is het grootste kasteel van Nederland. Het is vanaf 1892 op de ruïne van het oude kasteel herbouwd in neogotische stijl. Naast het kasteel ligt een kapel. In 1890 erfde Etienne baron van Zuylen van Nyevelt van de Haar (1860-1934) de kasteelruïne van zijn vader Gustave. Etienne was op 16 augustus 1887 in Parijs gehuwd met de Frans-Joodse barones Hélène de Rothschild (1863-1947), een erfgename uit de familie van rijke bankiers De Rothschild. Mede dankzij haar fortuin had Etienne de middelen om het voorvaderlijk kasteel op een grandioze manier te laten herbouwen. Voor de herbouw van het kasteel werd de beroemde architect Pierre Cuypers ingeschakeld, die er in nauwe samenwerking met zijn zoon Joseph Cuypers 20 jaar mee bezig zou zijn (van 1892 tot 1912). The myths and legends of Native American cultures record a time when destruction came from the sky and destroyed all the giant animals. These legends seem to describe events surrounding the last great mass extinction, that of the Ice Age megafauna around 10,500 BC. The latest research seems to corroborate these ancient Native American legends and reveals that Earth was subjected to an unimaginable mega-disaster which was the cause of this mass extinction. Did cosmic lightning wipeout the mammoths? Siberia, Alaska, Malta! Three mass slaughter sites! Sites littered with carcasses and skeletons captured in violent death throes. Some are petrified as rocks (Malta), some are preserved in ice (Siberia), some are surrounded and invaded by limestone(Hot Springs – Dakota). Others are entombed in Bitumen (La Brea-L.A.) and peat Bogs (Snowmass- Colorado). Many are impeccably preserved whilst the bulk are shattered, dismembered and rolled (Gibraltar) by forces so violent and unseen today that we are naive to their mysterious powers! These extinct species met with an instantaneous and horrific death…. Many of the mammoth tusks were peppered with tiny iron particles driven deep into the ivory. More they were surrounded with nano diamonds, carbon spherules and radioactive (isotopic) beryllium, iridium and other evidence of a devastating and deadly atomic fusillade…. [One researcher] is adamant that the native American Clovis cultures witnessed this event. He quotes the “Lakota” peoples. But what was the cause of this Megalightning? Adrienne Mayor, writing on the mythology of the native American tribes, emphasizes it was not ordinary lightning but Cosmic “Thunderbolts”. These were world shattering discharges. Rick Firestone believes they can be traced to cosmic ray invasion from an exploding supernovae. Others believe that it was an extraordinary coronal mass ejection (CME), or possibly a comet, such as Shoemaker-Levy 9, or perhaps a series of meteorites. Importantly, a large body now consider the possibility of planets in electromagnetic disturbance. They site Jupiter and its moon Io as a example of planetary interplay. Regardless of the source of destruction, “rock art” (petroglyphs) offer powerful evidence of the operative tool. Anthony Peratt, a plasma research physicist at the Los Alamos National Laboratory, has noted the extraordinary similarity between “squatter man”(see illustration) petroglyphs and his laboratory plasma beam instabilities. He maintains that early man recorded in rock massive plasma discharges in the heavens. These incredibly powerful electromagnetic instabilities eventually discharged causing devastating effects. Magnetic reversals, x-ray bombardment, devastating winds, purging floods, wild fires, mountain building and a host of other cataclysmic scenarios visited Earth. Everywhere in the world you go from Australia’s Kimberley’s to Saudi Arabia and the U.S. you see rock art replications of these plasma instabilities. The tool of mass extinctions? Diagram showing the estimated path of the north geomagnetic pole from 8000 BCE to 2000 CE. Leibniz’ beloved adage that natura non facit saltus or ‘nature does not make leaps’ has had to endure a fair amount of comeuppances since it gained currency. An arresting example today of our unpredictable world is the rapid wandering of the north geomagnetic pole in recent years – an eastward movement currently estimated at a rate of 37 miles per year and possibly still accelerating. The surge of attention for this in the popular media highlights a widespread fear of the unknown, in which the possibility of a complete reversal of the earth’s magnetic poles occupies a prominent part. Yet although signs that the earth’s magnetic field is really about to reverse are wanting, the likes of Carolus Linnaeus, Isaac Newton, and Charles Darwin might have turned over in their graves at today’s grand display of nature’s capriciousness. Whereas newspapers and television programmes delight in the phrase that the north magnetic pole of the earth has not been known to move with such celerity “since records began,” modern scientists are not at all taken aback by these developments, as such man-made records are really all but hoary. Archaeologists, climatologists and geophysicists have been studying records of past pole movements buried in the earth’s crust since at least a couple of decades. Extracting archaeomagnetic measurements from baked clay materials, collected from archaeological sites, and – for earlier periods – from geological sediments, painstaking analysis has enabled researchers to model the past evolution of the earth’s magnetic field all the way back to the onset of the Holocene. The polar antics of antiquity help to place recent displacement patterns in a wider context. In addition, knowledge of the past positions of the poles is a vital tool in the study of transient celestial events in historical times – for along with the geomagnetic pole shifts the auroral oval, beneath which displays of the aurora are most frequent. An especially active episode – known among Russian researchers as the Sterno-Etrussia geomagnetic excursion – occurred between ±800 and ±600 BCE and lasted one or two centuries. During this time, the geomagnetic dipole inclined more than 10º towards the East, taking it to ±81.4º N, 45.1º E, just to the northeast of Spitsbergen. As the Babylonian city of Nippur was located at the same longitude, the dipole magnetic latitude of Babylon at that time was 40.8º N, as compared to the present-day value of 27.0º. This suggests “a higher auroral incidence at Babylon in 567 BC than at present,” as some have noted. It would also have predisposed the area to a richer variety of auroral forms, including the occurrence of magnificent overhead aurorae – or coronae; for comparison, the overhead aurora of 14 May 1921 occurred at 40º magnetic latitude, and the one of 1 September 1859 – the famous “Carrington Event” – at 36º. Despite the presence of “lightning,” this was not an ordinary tempest: the luminous structure of wheels, animal-like creatures, “an expanse, sparkling like ice” and the crowning image of the enthroned deity all find close analogues in eyewitness reports of the polar aurora. In the bigger picture, it can be shown that prophetic visions reducible to auroral apparitions – and perhaps accompanied by hallucinations, induced by ambient electromagnetic fields – have fuelled significant changes in prevailing cultural paradigms. It may not be coincidental that the Sterno-Etrussia geomagnetic excursion roughly corresponds to the so-called “axial age,” which was typified by spiritual revolutions extending from Greece to China. Confucianism and Daoism in China, Buddhism and Jainism in India, Zoroastrianism in Persia, the reformative utterances of the Hebrew prophets and Greek philosophy all share a common origin in this epoch. Although it is still premature to finger a geomagnetic cause for this age of reforms, the case of Ezekiel justifies the search for a correlation between geomagnetic upheaval and the inspirational visions had by many sages at this time – suggesting that the polar adventure of this era proved quite beneficial to denizens of the Old World. If the cultural history of mankind thus progresses in leaps and bounds, sometimes in tune with the dance of the magnetic poles, all are advised to allay “Doomsday” fears and to enjoy the ride. Je lacht je rot op Feacesboek. "...One other very interesting artifact found on the same place in Ecuador is the so-called Pyramid with the Eye. The eye is an inlay. The stone is grey and white and you have thirteen steps. It looks exactly like the Pyramid with the Shining Eye on the One US Dollar. If you put this pyramid under black light, the eye is shining very strongly and it looks really like an eye, but not really like a human eye. Here you have a close-up of the eye and you can see the colors of the inlay. (All what we can say is WAKE UP ,race of aliens has control the world by an ancient elite until now they are same)..."
Ik twijfel of die laatste zin tussen de haakjes werkelijk van Klaus Dona afkomt. The rest is just distraction and fear.